Gulfstream Park’s Saturday card does not have any stakes races, and the two co-features are $25,000 optional claiming races with $43,000 Purses. But there should be considerable excitement, in large part due to Gulfstream’s guarantee that there will be a pool of at least $300,000 in the Rainbow 6. First post is 1:15 p.m. for an 11-race card. The Rainbow 6 is on races six to eleven, with the sequence scheduled to start at 3:58 p.m.
On the first race, there is an overnight carryover of $2,653.97 on the Super Hi-5. It is a $1 minimum bet that requires picking the first five finishers in correct order, with no consolation payoffs. Conditions are listed as fast and firm. The Weather Channel forecast is for zero percent chance of rain during racing hours. 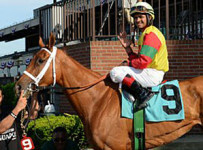 The fifth race is a $25,000 optional claimer at one mile on turf for fillies and mares 3-years-old and up. The tenth race is a $25,000 optional claimer at five furlongs on dirt for 3-years-old and up. Both races have $43,000 purses. We will be at Gulfstream and will have coverage during the afternoon on our blog, which can be accessed on the menu bar at the top of the home page of this Web site. The $300,000 guarantee will follow a wild Friday on which there were no Rainbow 6 tickets with all six winners. There were three tickets with five winners. Each received $16,256.94 on a 20-cent bet. The rare lack of at least one ticket with six winners was a consequence of four winners at 13-1 odds or higher in the Rainbow 6 races. In the fourth race (first leg of the Rainbow 6) the winner was Uncle Runt at 104-1. Per its rules for days without the jackpot takedown requirement of just one ticket with all six winners, Gulfstream added $20,902 to the carryover—raising it to $159,786. Thus, just over $140,000 will have to be bet for the pool to hit $300,000. If it falls short, Gulfstream will make up the difference. 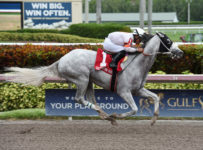 But based on betting patterns on Saturdays, it is likely that bettors at Gulfstream and at other locations will combine to wager $200,000 or more on the Rainbow 6. The Rainbow 6 is a 20-cent per combination-only bet. Multiple horses can be used in each race, thus setting up a ticket with multiple 20 cent combinations. For example, a ticket with two horses in each race has 64 combinations and costs $12.80.